You probably heard that a commercial hybrid closed loop (the 670G) has been approved by the U.S. FDA and, like everyone else, are wondering what that means for #OpenAPS. High five @US_FDA @FDAcdrhIndustry on several tech improvements in recent years getting reviewed quickly and approved ahead of schedule! …This means the company has time to work on user guides and usability. As we’ve told every device company we’ve encountered, we (the #OpenAPS community) are happy to share everything we’ve learned. And we have learned a lot, including what it takes to trust a system, how much info is needed to help determine if additional human action is needed, what to do in all kinds of real-world situations, and more. We hope the companies continue to work with people with diabetes who have experience with this technology from both clinical trials and the DIY world, where we’ve racked up 350,000+ hours with this type of technology. Because setting expectations with users for this technology will be key for successful and sustained adoption. This doesn’t really mean anything for #OpenAPS, though. The first generation of AP technology is similar to #OpenAPS in that it’s a hybrid closed loop that still requires the human to input carbs into the system, but it unfortunately has a set point that can not be adjusted below 120mg/dl. For many people, this is not a big deal. But for others, this will be a deal breaker. For DIYers, that lack of customization will likely be frustrating. And for many families, the lack of remote data visualization may be another deal breaker. And, like with all new technology and devices, getting this stuff covered by insurance may be an uphill battle. So while optimistically this enables many people in the U.S. to finally access this technology (yay) without having to DIY, it won’t necessarily be truly available to everyone from a cost or access perspective for many years to come. 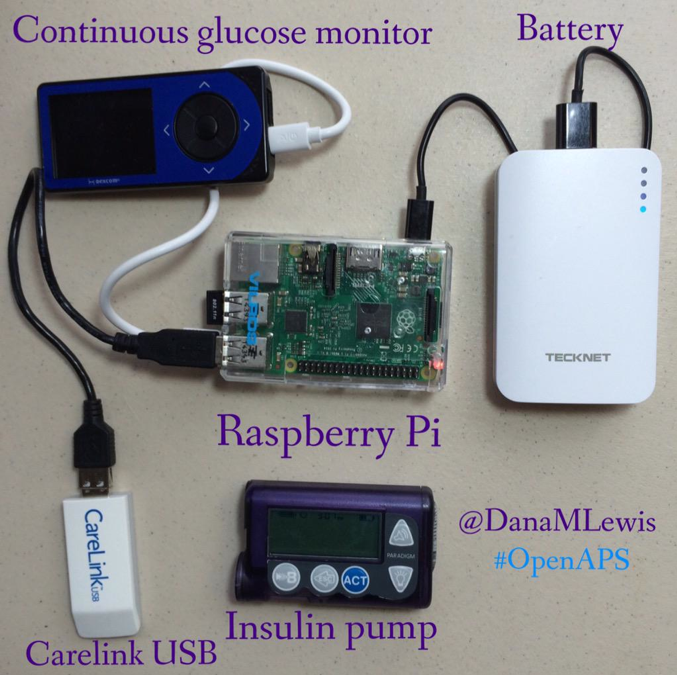 So #OpenAPS and other DIY technology may still be needed from a cost/access perspective to continue to help fill gaps compared to current status quo with basic, non-connected diabetes devices (i.e. standalone pump and CGMs). I also know that many of the parents of kids with T1D are disappointed, because the initial approval is for kids 14+, and it even notes that the system is not recommended for kids <7 or those taking less than 8u of insulin every day (usually young kids). I asked, suspecting it was related to occlusion, but it sounds more like they just don’t have enough data to say for sure that the system is safe with that small amount of insulin, and they’re working on additional studies to get data in that area. Ditto, too, for more studies allowing different set points. They stuck with a 120mg/dl set point in order to speed to approval, but fingers crossed they get other studies done and new approvals from FDA before this device ships in the spring – that would be awesome. And I was glad to hear that they do have an “exercise” target of 150. That’s a bit of good…but I’m still hesitant that it is enough. From my personal experience knowing net IOB (here’s why net IOB matters) an hour before and when starting exercise is required information to help me decided whether or not I will need carbs to prevent lows during exercise. I don’t think this device will report on net IOB, but I admittedly haven’t seen the device and hopefully I’ll be proved wrong and the data available will be good enough for this purpose! So in summary: this is good news. But we still need more FDA approved commercial options, and even with a single “commercial approved option”, it’s still ~6+ months away from reaching the hands of people with diabetes…so we as a #WeAreNotWaiting movement continue to have work to do to help speed up the processes for getting enhanced diabetes technology approved and available on the market, with access to view data the ways we need it. *(Yes, in the title of the post I called it a commercial hybrid closed loop artificial pancreas system. It’s a hybrid closed loop, as is #OpenAPS, but it’s also on the road/part of the suite of more complex artificial pancreas technology. I realize to many PWDs “artificial pancreas” means a lot of different things. Quite certainly, regardless of definition, an artificial pancreas or hybrid closed loop still requires a lot of work. It’s not a cure by any stretch of the imagination. But it’s easy for the media to describe it as an AP, and I also find it a lot easier to describe the small device accompanying my pump when strangers ask as an “artificial pancreas” followed by an explanation rather than saying “hybrid closed loop”. My newest #OpenAPS rig is roughly the size of two sticks of Chapstick. Think about that, especially in context of my earliest rig of a Raspberry Pi, Carelink stick, battery with enough power to last a full 12 hour day (or more), and the bulk that it added to my bag. I was happy to carry it, but once Oskar started working on a smaller rig with better range, for many people it was a game changer! And now we have another option with a new open source hardware board called the “915MHz Edison Explorer Board“. It’s a board designed to hold an Intel Edison (the ‘mini computer’), and it also has a 900MHz antenna on it – which means we can use it to talk to the insulin pump. This eliminates the need for a separate ‘radio stick’ – like the Carelink or a TI or similar. This is a huge improvement! …and that’s all that’s strictly required. You can use openxshareble to read BG data from the receiver directly, but that’s currently the flakiest part of my setup, so I still recommending hotspotting your phone to pull BG data down from the cloud – and more importantly, so you can use Nightscout or similar to visualize what the loop is doing. So, today’s post is about the new, shiny, smaller rig, and I know everyone wants to know how to get the parts to build their own! **Update** – You can order an Explorer Board here. . Keep in mind Edison and battery are not included, so if you don’t already have an Edison, you’ll want to order one of those, too. Improved #OpenAPS docs in the works, too! Also, stay tuned – we have a new setup script and guide being developed and tested to streamline the setup of an OpenAPS implementation using this board or any of the previous hardware. These new docs will streamline the installation and configuration of the components required for anyone to build a new OpenAPS implementation for themselves, so they can more easily focus on testing the algorithm and decision making process that’s a critical part of DIY looping.